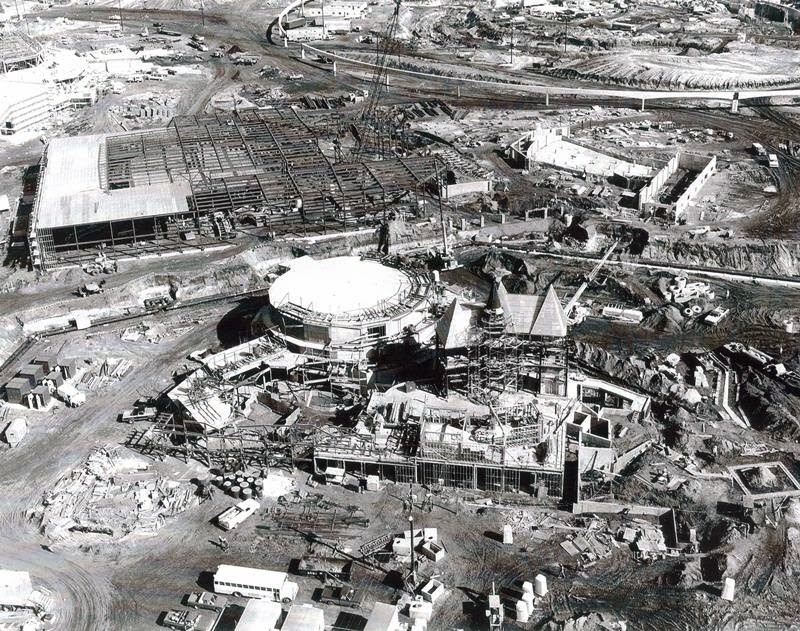 Late last year we looked at the construction of EPCOT Center. One pavilion we spent a good deal of time tromped through was Canada construction site. Today we want to change our vantage point and take to the skies over the pavilion. What I love about the boots on the ground glimpses we were able to peruse last year were the real world sense of time and place they gave us. You could see the men hard at work and you could almost feel the mountains rising up out of the ground. They also gave us a functional sense of how much forced perspective was at use throughout the pavilion. While the Hotel du Canada may have looked enormous, you could see the layers of scaffolding paired up next to the ever shrinking windows. In this photograph, however, we get a much larger view of the world surrounding Canada. This photograph was taken early in the pavilion’s construction, and as such we are given great perspective on the size of the pavilion in comparison to other pavilions, how close the other pavilions actually are to one another, the footprint and foundation of Canada, and how the earth and waterways were shaped around and through the pavilion. The Circle-Vision 360° theater, which would soon be home to O Canada, hasn’t been obscured yet and you can see just how large the theater actually is. It may be exploring the larger world of EPCOT Center, but we still get that sense of a real world place that evaporates once the park opens its gates. There are piles of concrete structures, wooden beams, rebar, girders, and dirt. There are trucks, and even a couple of buses, parked all throughout the site, delivering crew members to wherever they might be needed. There are clusters of porta potties and trailers scattered about as well. All of this just lends itself to the massive scope of the project. When we get down to it there may have been a small team working on the rockwork of Canada, but when taken into consideration with the rest of the project, or even just the small corner pictured here, you start to understand just what an undertaking EPCOT Center was. Peering beyond the berm around Canada we can see the groundwork for The Land and Imagination pavilions in their very early stages. Maybe we’ll give them a little bit of time to develop and then come back to check on their progress a little later.